Poppies are an undeniable gorgeous flower. They improve the beauty of any garden or landscape. There are so many varieties of this beautiful flower, one can hardly choose which is the better of them all. You can grow Poppies from you garden or home. Here is how you can grow Poppies. Read the instructions for more information. To grow your own Poppies, select the seeds according to the type of flower you prefer. You can purchase seeds from your local nursery, Wal-Mart, grocery store chains or many other locations. The optimal weather to grow Poppies is when it is cooler outside. The temperature should be about 60 degrees. 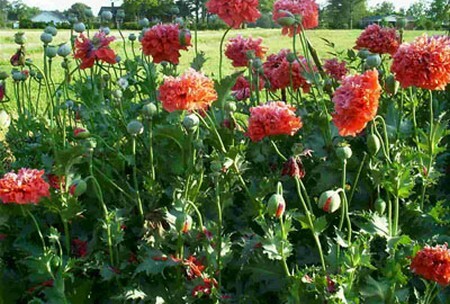 If you are planting your Poppies in a flower bed, make sure they will be drained very well. These seeds will also flourish inside a pot. It has to be big enough to let the roots grow. The soil needs to be loose and have a pH of approximately 7. Some green thumbs say that this Poppy can be grown in rocky, loose soils. The roots might like the rocks. Plant the Poppy seeds in shallow soil. Cover them lightly ad loosely. Give them ample space to grow or the flower may be smaller than you anticipate. If you start out planting them close, that’s fine. Simply remember to thin them out after they are well on their way flourishing. Be advised that germinated Poppy seeds don’t transfer well. After the Poppies have been planted, the soil needs to be maintained at moist levels while they are germinating. After this point, reduce the amount of water used to maintain the flowers. Poppies don’t grow as well with too much water. You should mist them with a spray bottle. If your flowers are growing big, you should definitely take the time to thin them. There needs to be about 12 inches between the plants. Thin out the smaller results, leaving the bi flowers to flourish.. The Poppy will bloomatabout 10 to 12 weeks after you plant them. The petals of the flower will fall after several days, but note that the seed will continue to grow and develop. It will reach the peak a few weeks after the leaves fall. Watch the gray band on the seed pod as it turns dark. The grey turns almost black. This is an indication that it is at the peak. The oppy is an annual bloomer and it will return for years to keep yout yard looking nice. Enjoy your Poppy flowers.